I welcomed with joy the invitation to extend a greeting to all of you who have gathered today at the Shrine of the Virgin of Ta’ Pinu, where in a great embrace of mosaics, Jesus and his mother await you. The image of the parvis you are inaugurating today sets before our eyes the beauty of a simple, contemplative prayer that is accessible to all, old and young: the prayer of the Holy Rosary. I also often recite the Rosary before a mosaic; a small mosaic of Our Lady and Child, in which it appears that Mary is at the centre, whereas in reality, using her hands, she becomes a sort of ladder on which Jesus can descend among us. The centre is always Jesus who humbles himself to walk among us men, so that we can ascend to heaven with him. In the prayer of the Rosary we turn to the Virgin Mary so that she may bring us ever closer to her son Jesus, so as to know him and to love him more and more. And as we repeat “Hail Mary”, we meditate on the mysteries, the joyous, luminous, painful and glorious phases of Christ’s life, but also of our lives because we journey with the Lord. This simple prayer, in fact, helps us to contemplate all that God in his love has done for us and for our salvation, and allows us to understand that our life is united to that of Christ. In prayer, we bring everything to God, our struggles, our wounds, our fears, but also our joys, our gifts, our loved ones … all to God. By praying, we allow God to enter our time, to welcome and transfigure all that we experience. Often make use of this powerful instrument, the prayer of the Holy Rosary, because it brings peace to hearts, to families, the Church and the World. And, please do not forget to pray for me. May the Lord bless you and may the Virgin Mother protect you. 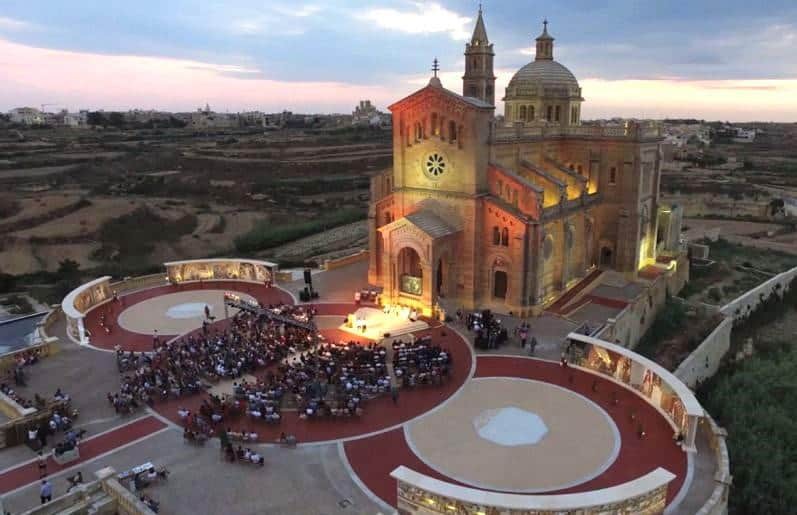 Aerial View of the Basilica of the National Shrine of the Blessed Virgin of Ta’ Pinu, the location where Pope Francis gave his message.